The anti-Irish brigade is in full flight as the reality that the border issue is a serious one – with no clear resolution and possibly catastrophic consequences. It shows up mass political ignorance of Irish affairs, an almost total lack of historical awareness and has surfaced some pretty unpleasant dormant bigotry and notions of Anglo-British supremacy. This goes from the top to the bottom starting with Laura Kuenssberg the BBC’s Political Editor “Brexit and the Irish border: Is all as it outwardly appears?”. Here’s the key line: “there is a sense building”. This is incredible reporting for someone of her status and can only reflect the extent to which the media elite is being absorbed into the desperation of the Brexit madness. Meanwhile over at the Daily Mail (Bella’s favourite newspaper) the anti-Oirish are in song: “Ireland ….what do you actually contribute to the EU … another peasant nation subsidised by British taxes…”. But maybe my favourite is: “Let’s just pull the plug on Eire…and let it sink. Ungrateful bunch”. HEY, IRELAND…! Daily Mail readers would like you to get your treacherous, Guiness-swilling, IRA-sympathising, peasant noses out of their utopian Brexit or they’ll put a minefield on your precious border, ban your products and force you back together with NI. Indeed the notion of the “EU-IRA” is even being flaunted. This is dangerous stuff – but reflects the mood of angry confused nationalism that is driving us over the cliff. Wild conspiracy theory from the BBCs most senior journalist and barking bigotry from Daily Mail readers won’t matter a bit as our European neighbours look on in astonishment. These attitude mirrors the conveyor belt of myths perpetuated against Scottish independence; subsidy junkies, Arc of Insolvency, Skintland etc etc, and it’s no surprise to see them wheeled out again against Ireland’s entirely legitimate issues about a hard border. All of this is entirely consistent with the politics of Leave: blame foreigners, blame immigrants, blame Bureaucrats, blame anyone but take responsibility. The political narrative of false-grievance, exceptionalism and stoking resentment will however soon run its course. The problem for Brexiteers and English xenophobes is that the Irish have been deeply embedded in European politics for a very long time, and whilst goodwill for the British is spent, Ireland has considerable allies who will support her. That’s because they’re not English they’re Irish!!!! 1) The UK Government is now in hoc to the DUP. And the DUP’s behaviour during the Brexit referendum and since is peculiar, to say the least. Brexit is palpably not in the practical interests of their base (largely agricultural or urban poor) but one senses that they may actually quite like a beefing up of the border, and thus the outward sign of separateness from the south. 2) Both Gove and Johnson, but especially Gove, are long term opponents of the Good Friday/Belfast Agreement. Some of Gove’s views on it are frankly bloodcurdling. while these two are deep in the machine, we can assume the Government will not deal realistically, never mind generously, with the issues before them. Put the two together, and it becomes increasingly difficult, bearing in mind also the treatment of Scotland in both the Smith Commission, the EVEL debate and the Repeal Bill, to see an attitude that can be accurately described as anything other than neo-colonial. There are those in the Conservative Party who would like to have a re-run of the troubles. And a hard border with the ROI would be a good thing. Or so they think. They have scores to settle and they believe that the military and security services would now be able to wipe the floor with Republicans. Would they be successful, would they win, or would they stir up a hornets nest with a few London spectaculars. Nothing is ever gained by force except the guarantee of more force in an endless cycle of misery. But there are many in Britain who think they are the military and economic power that they were a century ago. Listen to the talk about winning the war. Listen to the talk about defending Gibraltar by force. Listen to how they are economically going to take on the EU, and indeed the world, and win. Nothing is thought out other than blimpish testosterone driven bravado that clouds proper thinking. The EU exit is a mess, the ROI border is a mess, passporting of financial services is a mess, the right of EU citizens to remain is a mess, the divorce bill where Blighty was going to get money back is a mess. But still the belligerent Brits stumble on. Cruising for a bruising as they say in some parts, the loss yesterday of the appointment of a British judge onto the 15 strong judiciary that is the UN International Court of Justice shows exactly how this increasingly busted flush of a country is viewed. Ah but, at least like Kim Jong-in, they’ve got the nuclear missiles to rattle, in a Great Britain that looks headed in the same direction. 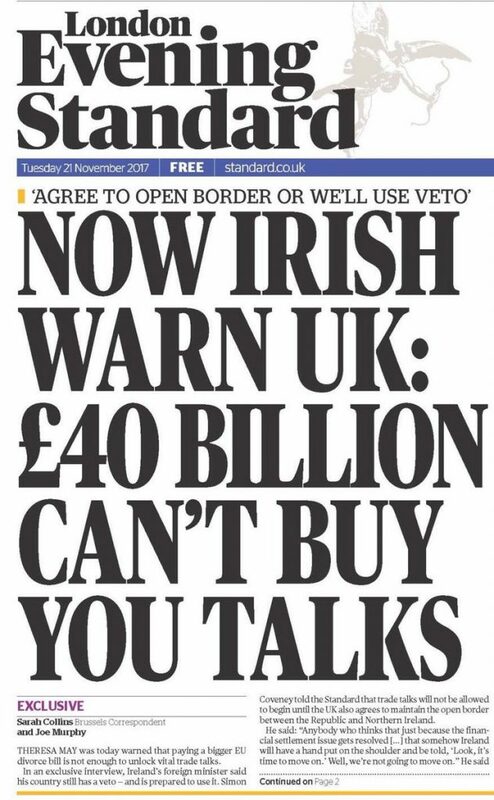 Now, this actually might be the meat of the matter, a hint that, eventually, the UK government is going to have to face up to the reality of the Irish question (in that the logical solution is a wet border) and, consequently, stand up to the DUP. Too true. Yesterday in parliament the truth was revealed: the British Governement are not legally codifying the Europan Convention on Human Rights (ECHR) via the Charter for Fundamental Rights as they are not transferring the latter with the former through the EU Withdrawal Bill. Application of Charter Fundamental Rights (CFR) in the ECJ courts creates Case Law and even under the European Withdrawal Bill has UK Supreme Court level status. So in effect we are copying ECJ case law on the Charter for Fundamental Rights into UK Common Law. So without without CFR the ECHR has no legal codification, less force and clarification. What is most alarming is that they have not thought this through! The Good Friday Agreement requires equivalence of Rights but the British government are not transferring the Charter which legally codifies ECHR. How are they going give legal equivalence to all of Ireland and not break the Good Friday Agreement?Make a list for debate? I think the Laura K article is examining the basis for any conspiracy theory, rather than confirming it. But she does link to an even more interesting RTE article which discusses what was a choreographed leak (so a sort of conspiracy) by the Republic and European Commission. The difference between the two starting positions (EU: four freedoms are indivisible, no restrictions on movement without leaving the customs union; UK: we’re going to restrict movement) are so far apart that some kind of border seems inevitable. Possibly rejection of this will lead to a no deal, but we could end up in a no deal situation through other means. Well she does tweet to her own piece saying ‘Conspiracy’? They’ll always be a deal Crubag, even if it’s a deal not to have a deal. The whole process is chaotic, it’s not thought out, save for the belligerent Britain thing. The Imperial Empire will not be back and if Blighty for the majority is impoverished, then so be it.